Accurate Results – thermal accuracy (+/-2%) and broad measurement range (-20°C to 250°C) give you results you can count on. Rugged, Compact Design – Easy to use, one-handed operation with a focus-free lens; tough enough to withstand a two meter drop and stow with the rest of your tools. Fully Radiometric Images – Store up to 5,000 JPEG image files with all temperature measurements right in the camera for future analysis, downloads, and custom reports. Plenty of Extras – Includes PC reporting software, plenty of memory with a 2 GB microSD card, and comes complete with a hard carrying case. 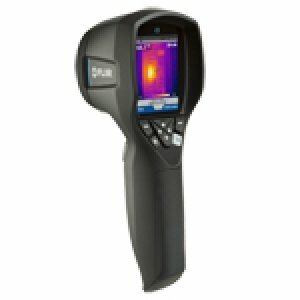 The FLIR i7 thermal imaging infrared camera offers 140 x 140 pixels of infrared resolution with 2% accuracy and < 0.10°C at 25°C thermal sensitivity - a robust combination of capabilities to quickly detect electrical, mechanical, HVAC and energy-audit-related problems. One-handed operation is unsurpassed for quick and easy menu access and feature selection. It comes complete in a hard carrying transport case. This new, next generation FLIR i-Series of compact thermal cameras feature: Higher resolutions for more detailed images and measurements. Wider fields of view for quicker scans of larger areas. And a more rugged design for tough environments. Flir i7 9Hz Thermal Imaging IR Camera 140 x140 Resolution.